We'll tour Romania's vibrant capital, Bucharest, with its "Little Paris of the East" architecture and lingering reminders of a brutal communist dictator. Then we'll head into Transylvania, where we'll visit fortified churches, cobbled merchant towns like Sighișoara, and castles made famous by an imported German king and the real-life Dracula. Finally we'll explore Maramureș, where everyday life still feels like an open-air folk museum. Hi, I'm Rick Steves. Back with more of the best of Europe. This time we got plenty of horsepower for an amazing trip…in Romania! Romania! [cart driver: România!] Thanks for joining us! 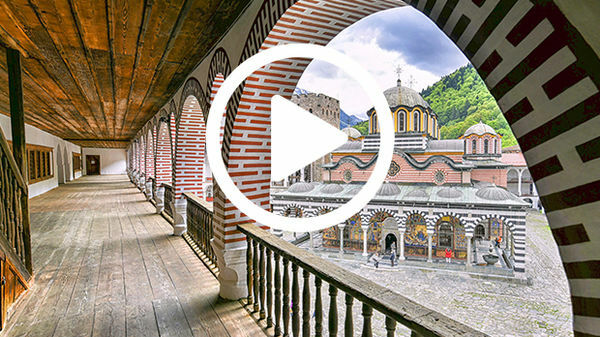 Romania is one of Europe's lesser-known corners, with a rich and fascinating history. Having come through tough times, today it's a member of the European Union, clearly on the upswing, and a rewarding place to explore. Travelers experience a land of contrasts. Its lively capital has a modern bustle. Its mammoth palace recalls a horrible dictator. A romantic king's retreat stands tall in the mountains, and medieval churches hide behind fortified walls. While many are lured by the Dracula myth, the reality is even more fascinating in this complex land where a vivid folk life still thrives. In the southeast of Europe, Romania sits where the Danube River meets the Black Sea. Starting in Bucharest, we visit Peleş Castle, head for the Carpathian Mountains and Transylvania, to visit Brașov and Sighișoara. We finish in the traditional region of Maramureș. Romania's capital, Bucharest — with about two million people — is a sprawling tangle of buildings. It's muscular and gritty — hard to like at first glance. But with a thoughtful look, it reveals its charms. Bucharest has a raw and bracing urban energy. First-time visitors are struck by its eclectic mix of architecture. Just wandering the streets with your neck craned up is entertaining. The foundation of this architectural jumble dates from the late 19th century. That's just after Romania became a unified country for the first time. In the 1860s, without a royal family to call their own, the Romanians went shopping for a king who could connect them with the European mainstream. They found one in Germany, where a prince looking for a throne agreed to become King Carol I of Romania. King Carol embraced his new homeland while bringing Western reforms and securing true independence for Romania. Under King Carol, Bucharest blossomed. He imported French architects to give Bucharest a romantic allure. Today, Victory Avenue is a showcase of the city's belle époque, when Bucharest was nicknamed the "Little Paris of the East." The avenue rumbles toward the recently rejuvenated Old Town. Under more stately architecture, you'll find inviting pedestrian lanes. This is the traffic-free heart of town. Locals enjoy a fun and relaxing scene, and there's almost no tourists in sight. And the nightlife scene is on the rise. Formerly abandoned shopping galleries are now sweet with hookah smoke. Food trucks fill a vacant lot with late-night sipping and socializing. If you're looking for fun after dark, this part of Bucharest can feel like one big, sprawling cocktail party. Thriving as it is today, Bucharest's Old Town was lucky to survive the communist period. Most of the historic center was wiped out by the dictator Nicolae Ceaușescu so he could build a grandiose New Town perfect for a megalomaniac. Ceaușescu took power in 1965, and through his 24-year dictatorship his ego ballooned. He became addicted to massive projects without budgets. After a visit to North Korea, Ceaușescu returned inspired to transform his city. He ripped out most of Bucharest's historical core to create this, his enormous Civic Center. Its wide boulevards and stone-faced apartment blocks all have a distinctive Pyongyang aesthetic. The culmination of his master plan was an immense palace with more than a thousand rooms, fit for a dictator gone wild. Ceaușescu literally starved his people to build his dream. Over six years, from 1983 to '89, thousands of laborers worked on it 24/7. When it finally opened to the public in 1994 — that was five years after Ceaușescu died — the Romanian people were both wonderstruck and repulsed. Today, guided tours lead gawking visitors around these vast and empty spaces. You feel small exploring its grand halls, huge staircases, and mega-ballrooms. Ceaușescu demanded the ideal balcony from which to deliver speeches…while looking out over his new town and a boulevard grand enough to match his ego. This palace, and similarly extravagant projects around the downtrodden country, created a powerful anti-Ceaușescu sentiment that ultimately led to his downfall. In late 1989, with winds of change sweeping the Eastern Bloc, armed revolution spread across Romania. An angry populace filled the square here, in front of the Communist Party Headquarters. They arrested their dictator and shot him on Christmas Day. This monument honors more than a thousand Romanians who died in the struggle to overthrow the tyrant and free their country. Today, Ceaușescu feels like ancient history, and Romania is proud to be part of the European Union. Joining local families on a Saturday morning in the park, you feel optimistic. While Romania's challenges are significant, it's clear the country is moving in the right direction. Heading north for the Carpathian Mountains, we leave Bucharest. Stunning fields of poppies are irresistible. And this quick roadside stop is just too joyful to pass up. Our next stop is Peleș Castle, the summer residence of Romania's first king, Carol. Carol chose a mountainous and forested setting that reminded him of his German homeland. And he imported German architects to create this fanciful hunting lodge. Prickly with over-the-top spires, Peleș ranks among Europe's finest Romantic Age palaces. And it boasts one of the most dazzling late-19th-century interiors anywhere. The Hall of Honor — with its red carpets, grand staircase, and venerable portraits — sets the tone. The woodwork is exquisite. The rest of the rooms have a grand yet somehow cozy elegance: glittering crystal chandeliers, thoughtful touches. King Carol ruled for 48 years. When summering at the palace, he took care of matters of state in his study. For over 30 years, the king dined with guests here. His impressive collection of weapons and armor stoked conversation. The library showed off the king's passion for education. And today, more than a century later, tourists from around the world still marvel at King Carol's castle. Just over the Carpathian Mountains, we cross into the fabled region of Transylvania. Trans-sylvania: It means "across the forest"…and that's literally where we've gone. We're spending the night in the handy home-base town of Brașov, which fills a scenic mountain valley. Most of the city's people live in boxy communist-era apartment blocks — many of which have been spiffed up. But the historic Old Town is much more charming. It's packed with locals enjoying a balmy evening. Thriving and appealing, Brașov offers glimpses into a midsize Romanian city that has its act together. Among other things, Transylvania is well known for its rustic and wild countryside and a medieval history with a surprising German twist. In the 12th century, Transylvania's Hungarian overlords needed help taming this wild frontier. So they imported skilled merchants and hardworking settlers from the German lands. For that reason, you'll find German-speaking enclaves and delightful German towns in this part of Romania. One of Transylvania's seven original German towns is Sighișoara — perhaps the most popular tourist town in all of Romania. The old center is entirely contained within its fortified hilltop. Several of Sighișoara's watchtowers still survive. And its historic centerpiece is its clock tower — proudly trumpeting the town's special status in the Middle Ages. Within the town's protective walls, visitors explore cobbled lanes, enjoy pastel German-style facades, and sip beers on the main square. Nearby, a statue honors the town's tenuous connection with an infamous Romanian prince, Vlad Țepeș. In the 15th century, he ruthlessly fought the Turkish Ottomans. Much later, he became better known as the inspiration for a vampire. Vlad had two nicknames: "Vlad the Impaler" and "Dracula" — that means "son of the devil." Vlad the Impaler was brutal in his defense of his homeland. While he didn't drink anyone's blood, he was sadistic, famously impaling his victims. The popular Dracula myth came much later. Dracula, in the myth, is a fictitious vampire created centuries later by the Victorian novelist Bram Stoker. He wrote his famous novel, Dracula, after being inspired by the tales of this bloodthirsty prince and other local legends. Vlad the Impaler? Important prince. Dracula the vampire? Just a scary fairy tale. Nevertheless, Dracula is big business for local tourism. For many, when in Transylvania, a stop at Bran Castle is considered a must. While people call it "Dracula's Castle," it has virtually nothing to do with Vlad the Impaler. But that doesn't stop the tourists from coming...or locals from selling their vampire kitsch. Past the tacky souvenir gauntlet, a cobbled path curls up to the castle entrance. Despite the fanciful legends, Bran is actually a fine example of an authentic medieval fortress, dating from the 14th century. Some of Romania's most memorable fortresses aren't castles at all — they're actually churches. While big towns were well fortified, smaller German villages were vulnerable to invaders. So what did the industrious settlers do? They fortified their churches. Dozens of fortified German churches — mostly built in the 13th and 14th centuries — are scattered across Transylvania. Like other medieval fortresses, they have beefy bastions, stout lookout towers, and narrow slits for archers. Entire communities could take refuge inside — within these wrap-around defensive galleries. This fortified church had a room for each family — and, when under attack, each family had a defensive responsibility. Stepping inside these churches feels like stepping into medieval Germany. Decoration was humble, pews were simple benches, Bible quotes are in German, and to this day, the services are Lutheran. Today most of Romania's ethnic Germans are gone — having emigrated in the late 19th century or fled to Germany after World War II. Those who remain speak a time-warp German and work hard to keep their unique cultural heritage alive. And the cultural heritage of Romania is many-faceted. Appreciating the diversity of the 20 million people who make up this country enriches your experience. The faces — as varied and beautiful as the land itself — tell the story. Of Romania's many people, one group in particular has struggled to fit in: the Roma. Also known as "Gypsies," the Roma originated in India. They were nomads who migrated over the centuries throughout eastern Europe and gained a reputation as musicians, thieves, and metalworkers. Romania has Europe's largest Roma population. They've had to abandon their nomadic ways and face the challenge of settling down. The classic Roma image is poor people in shantytowns. But most Roma live side-by-side with their Romanian neighbors, more or less fitting into mainstream society. And many Roma carry on the traditional craft of metalworking. We've been invited in to learn more. Rick: So how many years has your family been making copper? Emil: Four hundred and fifty years ago. Emil: Yeah, many generations. Six, maybe seven generations. Rick: I love your hat! Can I see your hat? Rick: So, this is a Roma hat. Emil: Yeah, it's [a] Roma hat. Rick: Do you like to be called "Roma" or "Gypsy"? Rick: Roma. What is important to the Roma people? Rick: So you speak a Roma language. Rick: So, today, for the Roma community, what's the challenge? Emil: Living [in] modern times, but [at the] same time, like, keep the traditions. Pondering the challenges of maintaining traditions in an aggressively modern world, we leave Transylvania, and drive north. At the fringe of the country, tucked next to the Ukrainian border, is Romania's most isolated region: Maramureș. Maramureș is fiercely traditional. Its centuries-old ways endure. Horse carts are commonplace. The men wear distinctive straw hats. The women are tough as the land. People work the fields as they have for generations. Village roads are lined with ornate wooden gateways. These gateways are intentionally elaborate — designed to show off the family's wealth. The gates protect family compounds: along with the home, you'll find a barn, a garden, and an old-time dipping well. And, if you've never tried one of these, locals are happy to demonstrate. Rick: Can you show me the well? Rick: Yeah? What do we have?…Yeah? Like this. OK…nice! OK, so in, to the horses? There we go! We're staying at a farmhouse B&B. Our host ritualistically closes the gate behind us. People here are superstitious — especially after dark. It's dinnertime, but first we're getting a little tour. Traditional Romanians collect their nicest belongings into one room to impress their guests. Heirloom dowries are lovingly displayed — these are bridal gifts going back generations. Tonight we're being treated to a farmer's feast. The food is typical of the region — rustic, delicious, and farm fresh. Our host, Anna, is determined to feed us well. Hearty salads, cabbage rolls. Polenta is a daily treat around here, and pork is big. In Romania, like everywhere else, food is especially tasty when it's local and fresh. And everything goes better with the local firewater. After dinner, the evening continues in the music room, where Anna's husband gets out his violin and shares some rousing folk music. In this traditional community, many homes are busy with small-scale crafts and industry. Just up the lane, we meet a family who welcomes us into their cozy yet busy world. The daughter, using a technique that goes back to ancient times, gracefully spins raw wool into yarn. Inside, her mother weaves the yarn into bolts of cloth, which will eventually be made into heavy woolens for the winter. Next door, a watermill does the same work it's done since medieval times. With the flip of a giant lever, George, the miller, sets things in motion. All of this powers his fulling mill, which takes the neighbor's woven wool to the next stage. Wooden hammers relentlessly pummel the fabric. With the help of hot water, the wool is pounded into a dense felt. The finished product is heavy and warm — ideal for the frigid Romanian winter. The water wheel also powers grinding stones. To this day, villagers drop off their grain to be ground into everything from animal feed to polenta. And George also has his own still for making the local brandy, horincă. He stokes the fire and patiently stirs his heated plum mash to keep it from burning. After its steamy journey through his low-tech water cooler, George's beloved firewater trickles in to his bucket. And you can't visit George's distillery without tasting the final product. Maramureș has some of the finest wooden churches in Europe. Their graceful spires punctuate the countryside. Soaring skyward, they seem to connect earth with heaven. The exteriors show off the quality craftsmanship of local woodworkers through the centuries. And our guide, Teo, shows us how beautifully decorated the interiors are. Rick: Teo, this is remarkable. And how old is this church? Rick: How old are all these beautiful paintings? Rick: You know, they look…more simple. Like what you see [in the] 14th century in France or Germany. Teo: Yeah, it was a kind of a delay, or a very long-lasting tradition. Rick: And the carpets! I've never seen a church with carpets everywhere. Teo: They are gifts from donators, from parishioners, from the ladies. Rick: So [if] the ladies want to show their devotion, they bring a carpet? Teo: Yes, it's a kind of devotion, a kind of sacrifice, let's say it. Rick: And these beautiful embroideries — are these gifts also from parishioners? Teo: Yes. For example, here you can see it bears the donator's name, Jurca Pălăguţă. Rick: Oh, that's the name of the woman who embroidered this! Even modern churches are still built in the traditional wooden style. Dating from 1995, this one towers 250 feet, with artistic shingle work cascading from peak to eaves. Again, the technical mastery of the woodworkers is on display. Chunky timbers, precisely dovetailed, keep massive walls firmly in place. Just up the road is another unforgettable church — this one with an unusually joyful cemetery. In 1935, a local woodcarver — reviving an old tradition — began adorning what's known as the "merry cemetery" with a forest of vivid memorials. Each one comes with a whimsical poem and a painting of the departed in the moment of death or doing something they loved. Even if you can't read the poems, the images speak volumes: from a life-time commitment to a traditional trade, like weaving, baking, or wood-working…a more modern one like television repair, or to a passion for bicycles, a sad early end by a lightning strike, or a humorous memorial to a lifetime spent enduring a nagging mother-in-law. It's a poignant and good-natured celebration of each individual's life, as well as a chronicle of village history. And it's all painted in cheery blue to match the heavens, where these souls are headed. Traveling through Romania, I feel about as far from home as I've ever been while still in Europe. Sure, it's got some rough edges. But you'll enjoy amazing sights, endearing people, and rich memories. Thanks for joining us. I'm Rick Steves. Until next time, keep on travelin'.